Everyone loves quick tips and easy steps when it comes to fitness. Unfortunately, many fitness equipment manufacturers, diet books and supplement companies have only one thing in mind: profits. Profit is a great thing. However, it’s not a great thing when it’s at the expense of human beings who are searching for a way to get fit, lean, muscular and healthy. You think I’m about to say that the answer is to get frequent body fat tests, don’t you? But the healthiest way to gauge your progress is to make sure your strength levels increase when performing resistance exercise, make sure your endurance improves through cardiovascular exercise and make sure that your clothes fit exactly the way you want them to. When did we stop trusting ourselves to the extent that everything has to be successful by a measurement? Don’t we have enough pressure in our lives? It’s amazing how many people ask me how long my workout sessions are. The question should be, "How short are your workout sessions?" Long workouts are counterproductive. Numerous studies prove that more than one hour of an intense workout increases cortisol levels. Cortisol is a catabolic hormone that, among other things, will assist in destroying muscle. The body appears to be designed for quick, intense workouts. 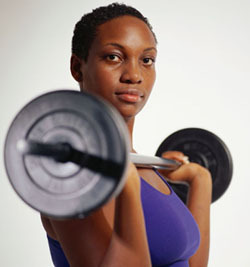 There is no need for more than 40 to 45 minutes of weight training and 35 to 40 minutes of cardiovascular exercise. I’m not suggesting that you’ll lose all your muscle or go to an early grave if you exceed these recommendations. I’m simply stating that best results are achieved with intensity, not necessarily long duration. A woman has one-third the testosterone of a man, so putting on a ton of muscle is not going to happen. You’ll look bulky if you’re carrying excessive body fat and building muscle. However, if you’re reducing body fat, you’ll eventually be able to see those lean, defined muscles. The number of days that you work out does not constitute level of fitness. I see a lot of people in the gym five to six days a week and they’d be better off playing ping pong. Consistency and level of effort is the key. I'd rather see someone work out three days per week with enthusiasm and intensity, than five inconsistent days of lackadaisical effort. In fact, for anyone who has trouble with motivation, I recommend only two days of workouts per week, but you must do it every week. This is my all-time favourite. In order to get a six-pack (physiologically it’s actually an eight-pack), or simply a flat stomach, body fat levels must be reduced significantly. This is achieved through a calorie deficit combined with exercise. In fact, unless you’re competing in an event or genetically predisposed, maintaining visible abdominals is a most difficult endeavour. A few extra pounds and they disappear. Hold onto a little excess water and they vanish. The bottom line is, abdominal exercises don’t give you a flat stomach. Abdominal exercises build the muscles, while reduced body fat through nutrition, weight training and cardiovascular exercise help to reduce overall body fat which leads to a flat mid-section. I hope you find these points helpful. Remember to bite your tongue when someone spouts out one of the above fallacies. With tact and patience, share your knowledge and help spread the word.